On fire: Stuart Baxter. Picture: Lefty Shivambu/Gallo Images. 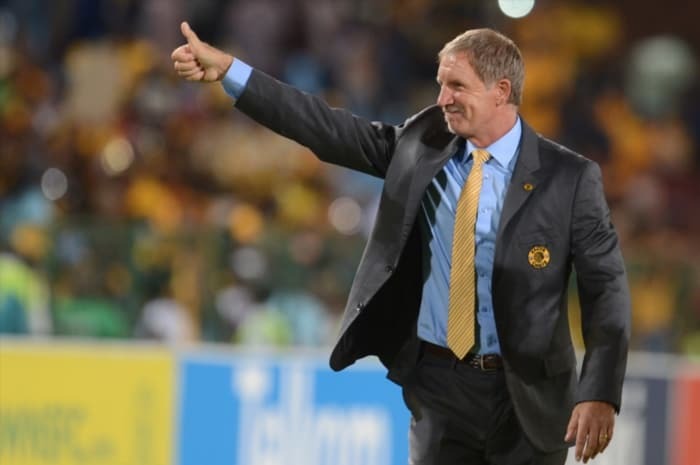 Kaizer Chiefs coach Stuart Baxter has refused to concede defeat in the chase for the Premiership title this season, despite a goalless draw with Wits on Wednesday. The result edged Mamelodi Sundowns — who now lead the defending league champions by five points — a step closer to lifting the trophy next month. Trailing the log leaders by six points heading into Wednesday’s tie, Chiefs needed all three points to keep the pressure on the Brazilians. “I don’t think there’s anybody that’s contemplating the end of the season already with three games to go,” Baxter said after the lively encounter in Johannesburg. With the top three all but secured, Wits did little to change their fortunes and look destined for a third-place finish, a spot better than last season’s surprise top-four finish. Baxter remained optimistic that his troops would claim as many points as possible before the end of the season. He said Chiefs were in the unique position of chasing the league-leaders, as opposed to fending off other teams hunting top spot, as was the case last season. The Amakhosi coach would remember last season’s limp to the title, where the team managed a dismal five points from their last five games, which proved enough to wrap up the Premiership with a game in hand. So far this campaign, Chiefs have bagged three points from two of their last five games and would have to return to their winning ways in their next tie against Free State Stars to keep on course for a nail-biting finish. Baxter hinted that Sundowns could still stutter at the last hurdle, with the winners of the Premiership seemingly to be decided on the last day of the season. “I was pleased with the effort that the boys put in and we know all the twists and turns…we had them last year,” Baxter said. “We know that when you’re playing and you’ve got it (Premiership title) within your grasp, it’s difficult to keep your focus sometimes.